(Left) Twisting with "flat" strands vs. (Right) twisting with "coiled" strands. OMG I am gonna to really have to practice this. Maybe I need to try it on someone else so I can master the technique first before I try it on my hair, lol. Wow! I never knew there was a difference. Great post! I've been a reader for months, but I was just going through the older posts in your Twists Series, to see if I could pick up some new tips for the 3 in 6 Challenge. 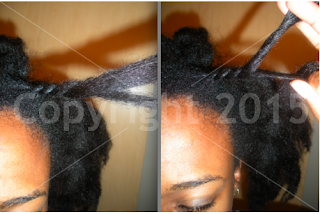 This post ties right in with why I've been able to keep the same set of twists for 3 weeks (which is miraculous for me, since they're med-large twists), and now I'm heading into week 4 with them before I finally take them out for a re-do. I hadn't seen this post or the two videos you linked in it, but I did see another video (that I raved about here: http://hairitis.tumblr.com/post/3284370471/a-small-change-that-makes-a-big-difference), that basically demonstrated the same thing. What a difference this technique makes! I'm loving this challenge, and loving the Twists Series! I'm so glad I've gone back to look at the posts I've missed. Thanks, Loo! Thank you so much for this! I am working on keeping my hair twisted up from now on. Wash n gos still tangle my fro which is starting to not be so small.